Mental illness related to childbearing is one of the most prevalent complications for childbearing women today. Dr. Michael O’Hara, Professor of psychology at the University of Iowa states in his book Postpartum Depression Causes and Consequences that the 1992 live-birth rate was 4,084,000 in the United States. About 40% of these mothers experienced mild mood disturbances (the “blues”), 10% had a major depression after delivery, and 0.2% became psychotic. Each year over 400,000 women suffer from pregnancy and postpartum mood disorders. The impact this has on a woman and her family can be profound. If left undiagnosed and untreated, it can lead to such tragedies as chronic affective disorders, poor infant-mother bonding, marital discord, divorce, suicide, infanticide, child neglect, and substance abuse. There are many psychiatric and psychological terms to describe the wide range of emotional reactions that women can have to pregnancy and childbirth. These include “maternity blues,” “adjustment,” “stress,” “depression,” “anxiety,” “panic,” “obsessive/compulsive disorder,” “distress,” and “psychosis.” The distinguishing features of the continuum and spectrum view of postpartum mood and anxiety disorders can range from very mild (“baby blues”) to very severe (psychosis), although the distinction between them can become blurred. Professor Brice Pitt was one of the first to describe postpartum depression in his 1968 paper “Atypical Depression Following Childbirth”. Words and phrases such as “euphoria,” “sadness,” “overwhelmed,” “crazy,” “losing it,” or “concerned” are part of the common language women use to express their emotional states after childbirth. Such a plethora of terminology indicates the complexity of this syndrome, and, in part, explains the confusion surrounding the issue. We have learned a great deal about postpartum depression (PPD) and similar disorders since Hippocrates studied it in ancient times, but it remains a challenge to put this knowledge to active use. One way to do this effectively would be to institute regular mental health screening of pregnant and postpartum mothers using a specific tool designed for that purpose. Nevertheless, herein lies the source of the problem: the vast majority of women’s physicians, childbirth educators, lactation consultants and pediatricians are not fully educated about birth-related depression and other mental distress. There is a wide gap between what we know and how we respond to mother’s needs. Education and screening beginning during pregnancy and through the postpartum year may be the most effective way to close the gap. Members of Family Support America have a key role to play in promoting maternal mental well-being and healthy families. The first step is becoming educated yourselves. Maternal mental health has been researched and studied by the scientific community since 1838, when the publication of two volumes by Esquirol began a 19th-century rebirth of interest in the topic in France. The first half of the 20th century witnessed a drop in studies of maternal mental health, but during the latter half, there was an increase in research among the diverse, yet interrelated, disciplines of psychology, biology, anthropology, and sociology. Many of these have focused on the etiology and treatment of PPD. We are indebted to Dr. James Hamilton (1907-1997) who dedicated his professional career to bringing professional attention to the importance of this topic. In 1962 he authored Postpartum Psychiatric Problems and thirty years later co-edited Postpartum Psychiatric Illness: A Picture Puzzle. A scientific organization was formed in 1980 and named for another early 19th-century French doctor, Louis Marcé, who published on the subject in 1858. The Marcé Society has held biennial international conferences on PPD and related disorders since 1984. The issues of public and professional awareness that have emerged because of these and other conferences are prevention, early detection, and intervention of postpartum depression. The importance of parent self-help support groups received little attention until the 1970s and 1980s, with the beginning of the postpartum consumer movement. This included prevention and treatment issues within the cultural component of social support systems. Scholars from several disciplines now recognize the role of social support. Anthropology professor Lawrence Kruckman of Indiana University of Pennsylvania suggests that it promotes mental and physical well-being, especially in the face of stressful experiences. The Pacific Post Partum Support Society (PPPSS) in Vancouver, British Columbia, Canada was the first organization formed to specifically address mothers’ mental health.. “Voluntary organizations can play a very important part in the support of the depressed mother. One of the main contributions voluntary organizations can make is to provide social support for the isolated mother” says Professor of Psychiatry Ian Brockington at the University of Birmingham . Postpartum Education for Parents (PEP), which began in 1977 offers perinatal support through its “Warm Line” and new parent groups in Santa Barbara, California. Depression After Delivery (DAD) is a national information and resource organization that has been disseminating postpartum materials to callers of their “800” number since 1985. 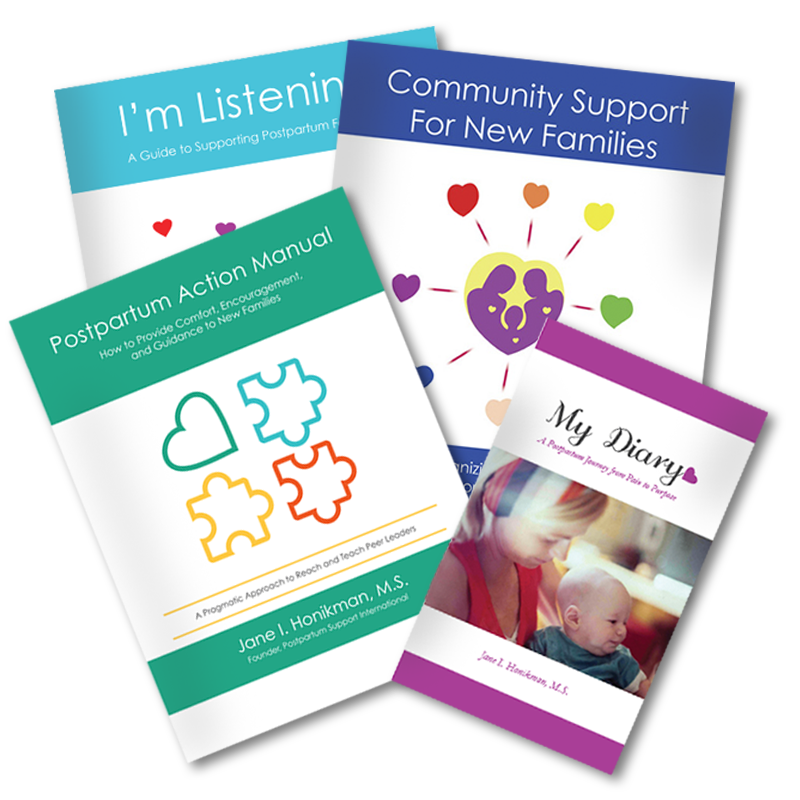 The global network is Postpartum Support International (PSI) founded in 1987. Members are the consumers, self-help groups and professionals who lead the postpartum social support and mental health movement. There now exists a wealth of scientific knowledge and successful models of support for national action. Tremendous attention is focused on a woman from her child’s conception through the postpartum period, which altogether comprises the process of childbearing. Keeping mentally healthy during this time is of vital importance to the future of the entire family and the community at large. In keeping with the ecological model that is at the center of family support, if the mother is not well, then everyone is at risk. A woman’s personal history of previous psychiatric illness and her family’s mental health history are clues for future mental wellness. Accurate assessment is critical. The reasons to screen during pregnancy and through the first postpartum year on a routine basis are linked to the consequences if women’s mood disorders are not detected and treated. This has extraordinary implications: the identification of women at high risk for major mood disorders is related to her intervention, treatment, and the prevention of further trauma. There is a valuable window of opportunity waiting for action. The woman needs to know that she can turn to her midwife, obstetrician, or family doctor and their nursing staffs for consultation about education, her options for treatment and referral to help. Childcare centers, parenting education programs, help-lines, clinics, schools, libraries and resource networks should be part of the solution too. She must not be abandoned or left to wander through a maze of unrelated and uninformed professionals. Childbearing is a time of vulnerability and therefore becomes an opportunity to build trust between the consumers and providers of health care. Once a suffering pregnant woman or a new mother has been identified with a screening tool, who will follow up to guarantee that she and her family get the help they need? The primary-care provider during her pregnancy has this responsibility. An appropriate referral for assistance includes the “mothering” of the entire family unit. In virtually every community there are many family support and resource agencies ready to offer assistance, but they must be well informed about the topic. Current literature suggests that parental depression is associated with behavioral and emotional problems in children of all ages. Consequently, by identifying and treating depressed women of childbearing age, we can reduce and perhaps ultimately eliminate unnecessary suffering. This has a long-range impact as well, since PPD has a high relapse rate. The stress of having a depressed or anxious partner and mother takes a toll on relationships. Routine and regular screening for depression during pregnancy will actually decrease the likelihood that a child will be exposed to a depressed mother over a long period of time. This is a formula for long-term mental health. It includes preventing mental illness whenever possible and early intervention at other times. To accomplish these goals, a concerted screening program is good public policy. Physicians and nurses must continue their own education about these complex disorders and speak out consistently about the impacts if they are left unidentified and untreated. There are specific treatment protocols and options for the woman, including the issue of breastfeeding and medications. Literature and audio- and videocassettes are available, and support practitioners should use them. These gaps in consumer education must be closed. For the sake of our society, maternal mental-health issues must become part of everyday language and action by our family support practitioners.